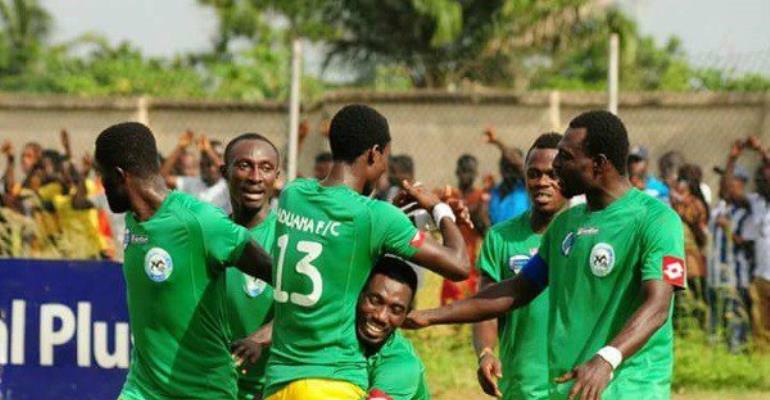 Aduana Stars deputy captain Elvis Opoku has set his sights on reaching the group stages of this year's CAF Champions League competition after overcoming Libyan side Al Tahaddy in the first preliminary round on Wednesday. The Fire Boys advanced to the next phase of CAF's elite club competition after beating Libyan side Al Tahaddy 2-0 at the Nana Agyemang Badu II Park courtesy goals from Elvis Opoku and Derick Sasraku- having lost 1-0 in the first leg a fortnight ago. Speaking to reporters after the match, Opoku expressed his delight with his side's advancement in the competition but pointed out their determination to reach the group stages. "When you look at the game, we were very lively, It was my first time playing in the Champions League and it's a massive competition for all of us. So were self-motivated and all the fans were yearning for a win considering the vast numbers at the stadium." "Our target is to reach the group stages and possibly reach the final so that we prove our critics who feel we are not worthy Champions of the Ghana Premier League,' Opoku said in a post-match interview. Meanwhile, Aduana Stars will meet ES Setif from Tunisia in the next round of the competition.